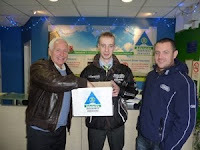 Michael Alder Co. Durham won Adelaide's December prize draw winning a £200 “Adelaide motorcycle insurance voucher” and the “Compact Disc AM/FM audio system”. Billy Nutt (left) and Marty Nutt (right) of Nutt Travel, seen here with Stephen Neeson from Adelaide, made the draw. WHO.... yes it's BikeWise Instructor - Mick Alder..... (who will from now be called 'Patrick'.... as he's got the luck of the Irish). Remember to visit the Adelaide Insurance Services website for your motorcycle (and other) insurance.